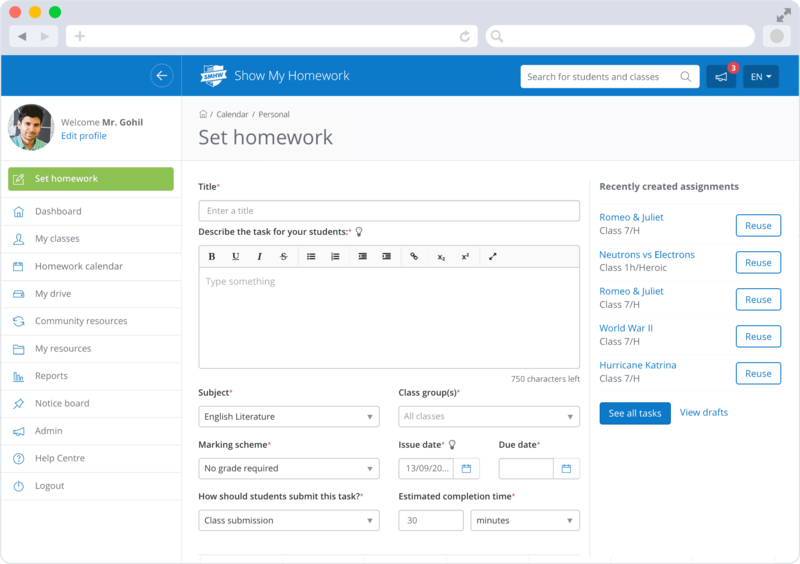 Homework made easy with the whole-school management software that puts homework online. 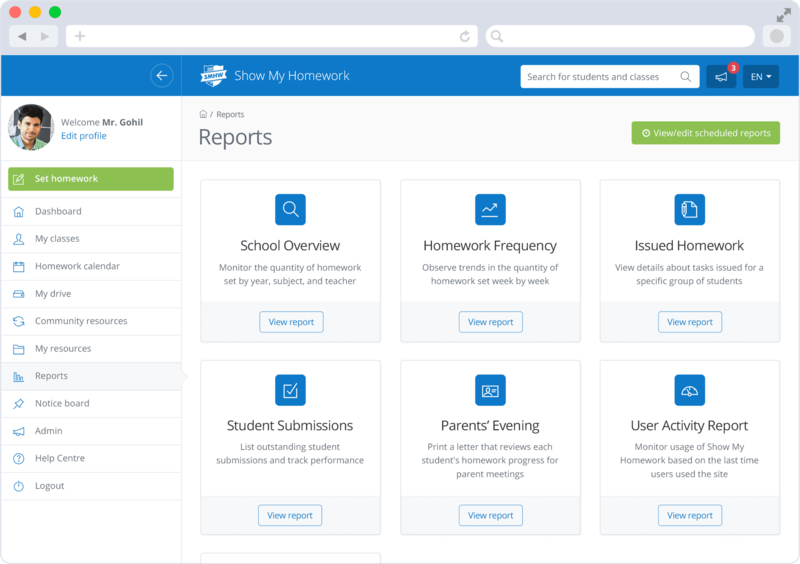 Experience complete homework transparency and powerful reporting with school-wide homework software. 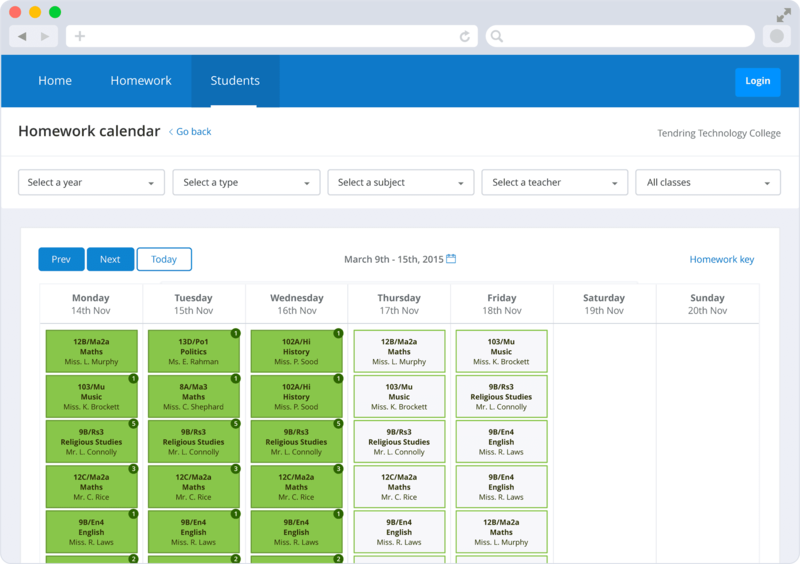 Easily monitor the amount and standard of homework set throughout your school with time-saving reports. 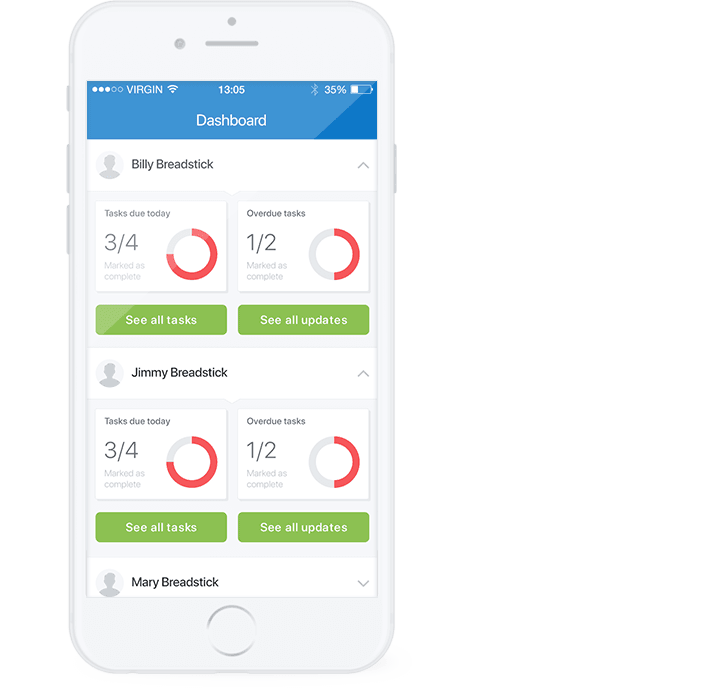 Ready in seconds, or scheduled direct to your inbox, reduce time previously spent tracking homework and know when teachers are in line with the school’s homework policy. Access the information that tells you where you and your team should be focusing efforts with Insights. View a breakdown of how classes, students and parents are engaging with homework tasks, telling you who needs extra attention and who needs recognition. Uniform reporting with everything accessible from one login provides a consistent approach to homework for everyone in school, making the setting, tracking, submitting and reporting of homework quick and simple. Reduce teacher workload and improve quality with the ability to set, mark and collect homework online. Use the resources around you - edit or reuse colleagues’ homework tasks and access a variety of teacher resources created by the wider Show My Homework community. 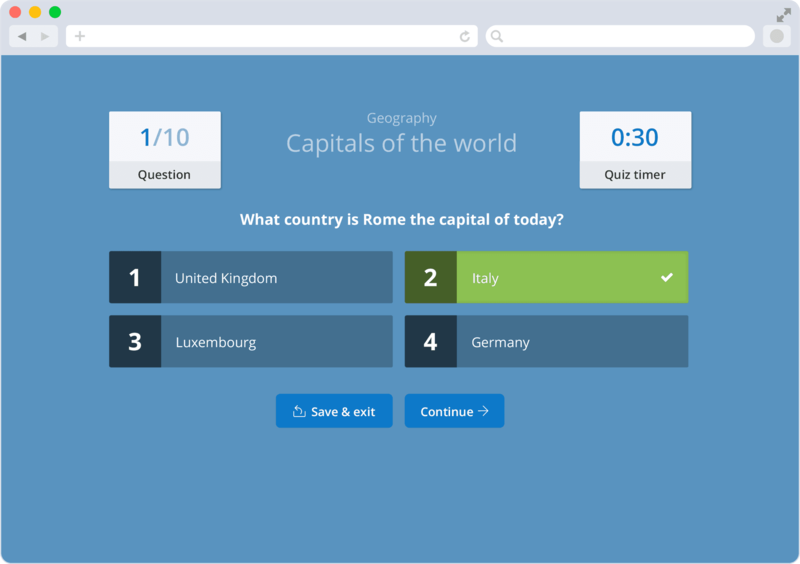 Reduce time spent grading with self-marking quizzes and spelling tests. 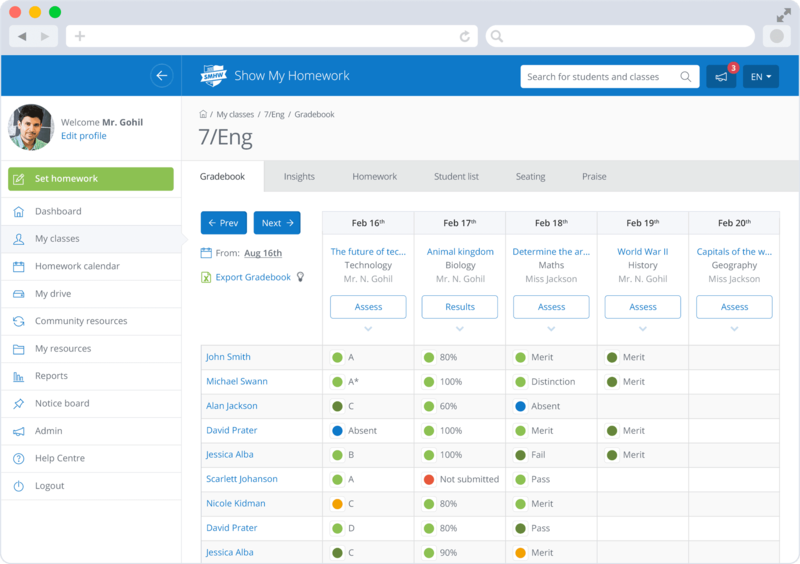 With all grades populated to your online Gradebook, any learning gaps can be quickly identified. Keep on top of your workload and stay organised by having all your homework needs in one place. 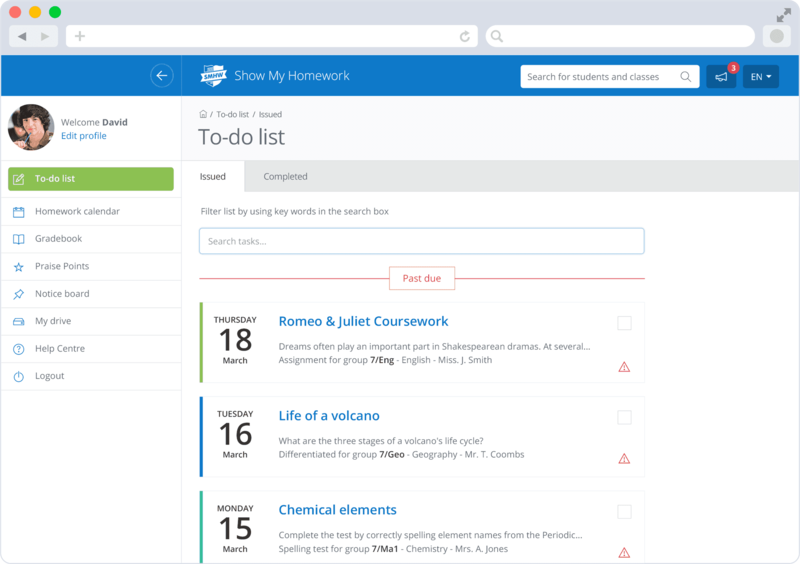 Set, track and mark all homework tasks from one account. 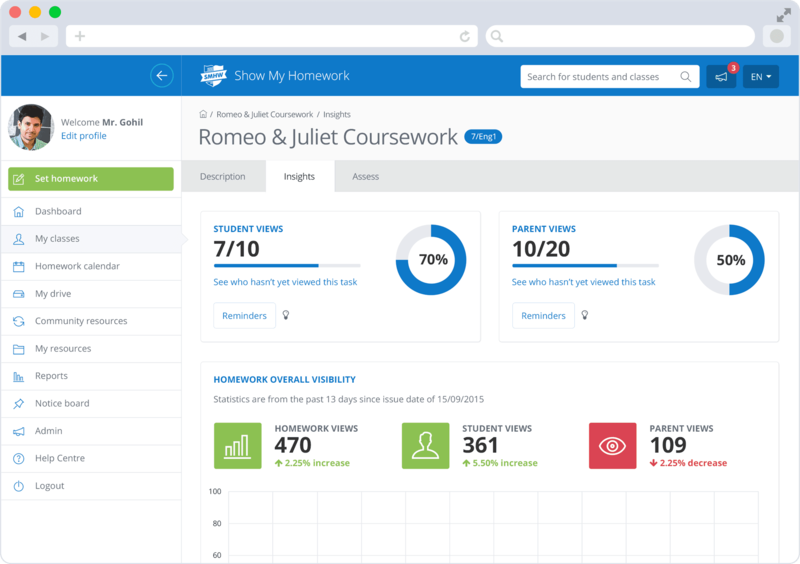 Improve student organisation and submission rates with homework tracking that engages students. Personalised To-do Lists, customisable in-app reminders and online submissions let students take control of their own education. Engage students with homework by delivering it to them through a medium they actually resonate with. By opting for an online homework diary you can make homework excuses a thing of the past with 24/7 access to homework tasks and no login needed. Emphasise the importance of homework and provide parents with all the information they need to fully support their children at home. Frustration regarding parents and homework stems from lack of information. By giving parents a full view of the homework their child is set, all resources needed and deadlines, they can fully support their child’s learning at home whilst knowing homework set is worthwhile. A strong home-school partnership is critical to whole-school success and a clear line of communication can foster this. With in-app push notifications sent to parents for homework deadlines, as well as events and announcements, parents are kept in the loop with school life. Parental engagement in homework can add up to 5 months onto a student’s learning. By giving parents insights into what homework their child has been set, they can be involved with homework without having to be intrusive, making home-learning more worthwhile and less hassle. Our software solves real classroom problems, which is why customers from the over 1500 schools we work with come back again and again. 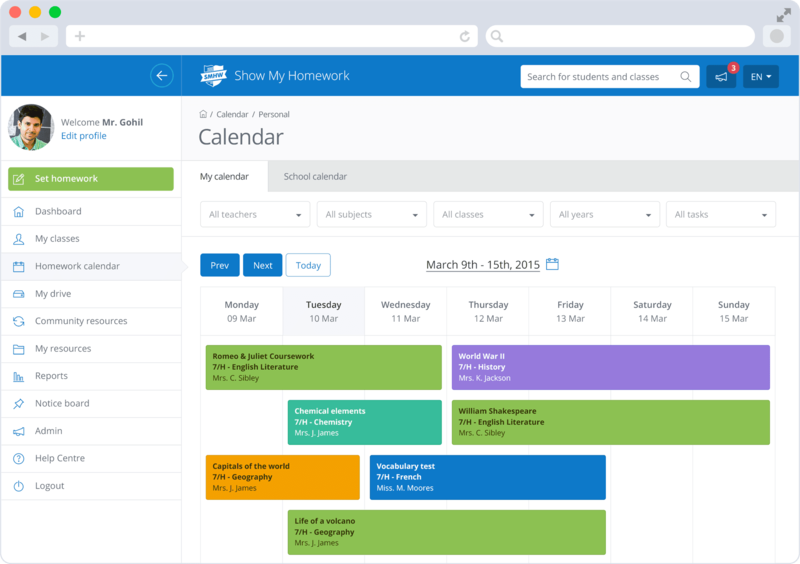 We are so much more than just an online homework diary, take a look at a full list of our features and see how we can help with your whole-school management. Each school has their own open calendar which makes homework accessible 24/7 for students and parents. This means that students will never have an excuse for not completing their homework. Our homework form prompts you to include all the necessary details students need to complete homework to the best of their ability. Differentiate homework or opt for our self-marking Spelling Tests and Quizzes. Cut down the time previously spent tracking homework with reports detailing the quantity, quality and submissions for homework - all ready in seconds, fully exportable and scheduled straight to your inbox. Finally see how students and parents are interacting with homework, see who’s completing their tasks and which parents are keeping tabs. Discover your most captivating homework tasks and engaged parents. Keep track of all homework marks from one centralised place with our online Gradebook. Leave comments for students in the Gradebook so they know where to focus their efforts and where they’ve excelled. Store all your important documents and school policies on the cloud with My Drive. Whether it’s lesson plans, timetables or useful resources for a later date, keep everything in one place, easily accessible. Free iOS & Android apps for teachers, students and parents deliver notifications about homework deadlines, submission dates and grades straight to your pocket, keeping everyone at school in the loop. 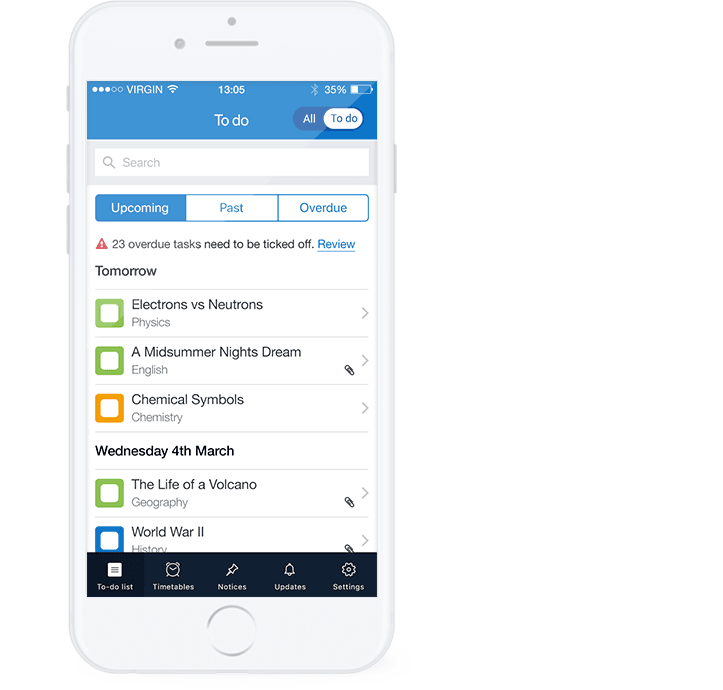 Our automatically populated homework To-do List allows students to keep track of their deadlines, and they can set Reminders for personal errands or link them to homework tasks - all accessible via the app. 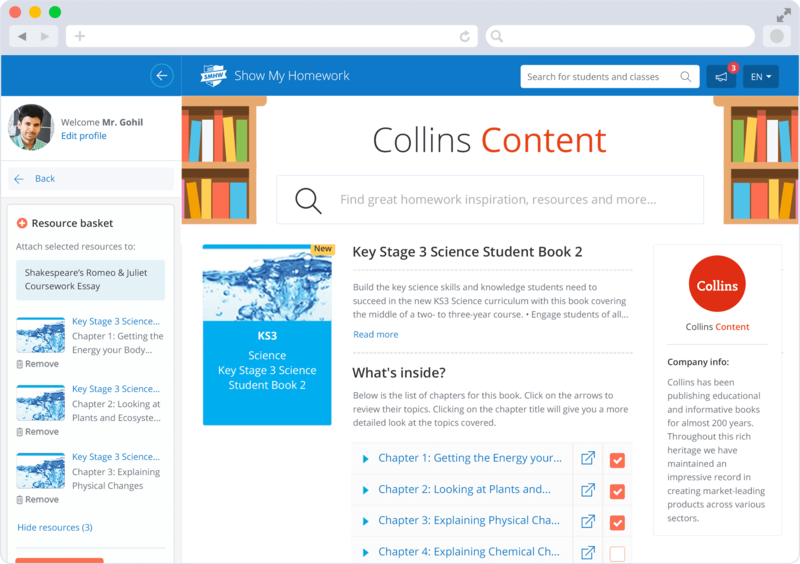 Access thousands of ready made homework tasks available to re-use and edit, produced by qualified teachers in the Show My Homework community. Save yourself time or help others by sharing your own tasks. 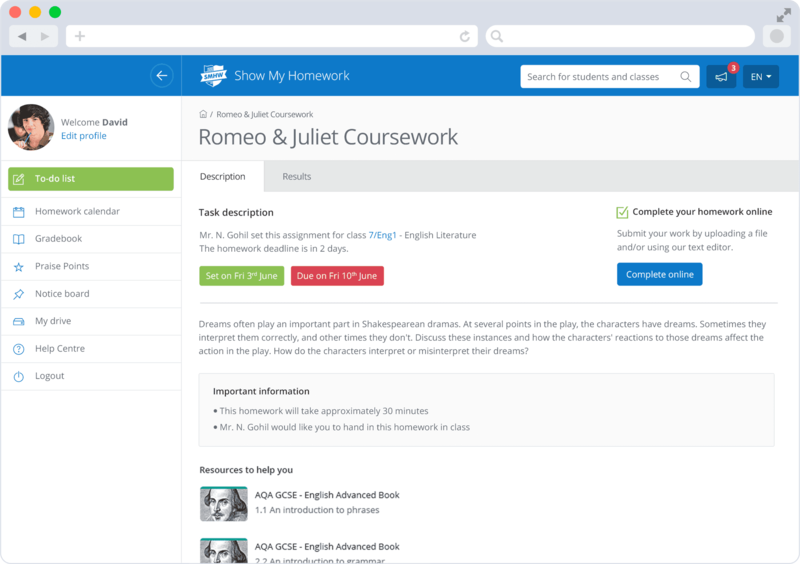 Our award-winning homework software is already used in 1500+ schools. Find out how we can help your school improvement and classroom management.